Every year during "bloom season", when the Louisiana irises are blooming, I always take hundreds of pictures of the iris blooms. Last year I decided to take more "view" pictures with some of the beautiful parts of Caddo Lake and Plantation Point Nursery in the background. I was quite pleased with the outcome and hope that you enjoy these "good views". You can learn more about Louisiana irises at the Society for Louisiana Irises web site. This picture of 'Ardoyne' was taken by the Koi pond which is full of beautiful Japanese Koi. There is an island in the middle of the pond (tank for your Texicans) and the two large "crane" birds stand on the island and give the fish something to think about. 'Ardoyne' was named by Joe for the Ardoyne Plantation Home in Houma, LA, where Joe lives. Houma is south of New Orleans! Louisiana irises are quite happy growing in water. In this picture they grow in a small pond that we modeled after Marie Caillet's famous pond in Little Elm, TX. The bridge is made of bamboo as we have a large stand of bamboo on the property. It will support people! Bamboo is used in many parts of the world as scaffolding. 'Black Widow' is one of my favorite Louisiana irises. 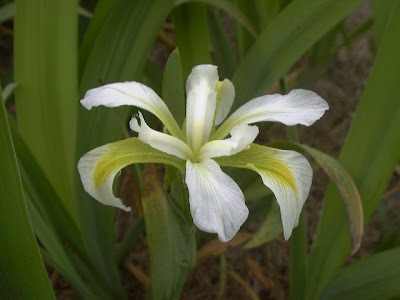 It is the older open form and is one of the darkest Louisiana irises. It is an early bloomer and this photograph shows a nice clump of it with Caddo Lake and bald cypress trees in the background. Caddo Lake in NW Louisiana is in the "Ark-LA-Tex", where AR, LA and TX all meet. It is a natural lake and there is much discussion concerning the way it was formed. Caddo Indians left a rich heritage in this part of the country and the parish (county) is named for them. Again, bald cypress trees grow in the water. The trees produce tannins that make the lake water very dark. 'Her Highness' is a collected I. giganticaerulea alba and is a beautiful white iris that grows very tall. Another favorite, it stands out in a crowd! A small pond is in the background and my sister grows fresh water shrimp in this pond. Louisiana irises in a "clump"
A large group of multicolored Louisiana irises can really be breathtaking. We are commercial growers and most of our irises are in four feet by four feet beds by variety. We purposely made some beds with many different colored irises which are unnamed and for viewing pleasure only. 'Fringed Gold' is a beautiful Louisiana iris and in this picture a large clump in full bloom shows the Koi pond and birds in the background. My sister's home is in the distance. "May pops" grow in the ditches of Northern Louisiana and as children we used to eat them when they ripened. They have a beautiful bloom. 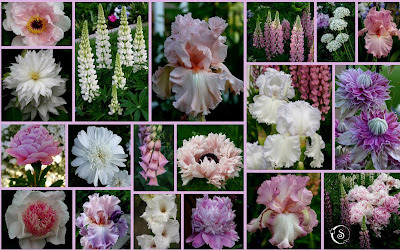 I posted this on the web and received pictures of many different varieties from around the US. This is a group of 100 four by four beds down near the lake. We have irises growing in just about every conceivable method. These are in dug beds lined with plastic and irrigated from the lake. Louisiana irises - a group of "Professors"
Professor Joe Merzweiller, a college professor at the University of Louisiana at Lafayette, LA in the 50's and 60's, was the first to produce a tetraploid Louisiana iris through chemical conversion. 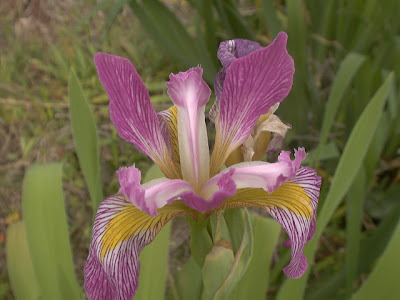 He then hybridized these irises and produced 10 registered Louisiana irises named for his professor friends -- Professor Jim, Professor Ike, Professor Marta Marie, etc. Tetraploid Louisiana irises tend to grow taller and have larger blooms. This picture shows a group of Louisiana irises growing next to the Koi pond and the greenhouse in the background. The huge "sandstone" rocks on the left were dug up on the property and will one day be part of a "water feature" on this pond. "Professor somebody" in the front with 'Her Highness' in the background. The white object in the far background is the gate onto the pier that goes out 150 feet into Caddo Lake. This picture shows a group of Louisiana irises in full bloom with the "fresh water shrimp" pond in the background and Caddo Lake in the far background. Another bunch of "Professor Somebody" (maybe 'Professor Jim') growing near the lake. The group of yellow irises in the middle background are iris.pseudacorus, a native of Europe, that grows great in water. 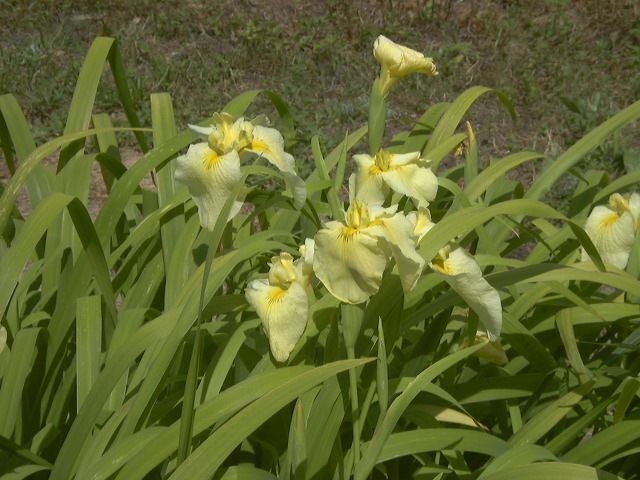 Unfortunately this iris is often sold by nurseries as Louisiana irises and are often used by landscape companies when planting irises in the landscape. They are very invasive! The background shows the pier and boathouse behind the bald cypress trees. This picture shows a large clump of white Louisiana irises with Caddo Lake and the bald cypress trees in the background. I failed to note the name of the iris but here they are just a part of a "Buena Vista". Another group of Louisiana irises in full bloom with a great picture of the edge of Caddo Lake and bald cypress trees in the background. Caddo Lake is a 25,400 acre lake and wetlands that is located in NW Louisiana and NE Texas. The lake is named after the Southeastern culture of Native Americans called Caddoans or Caddo, who lived in the area until the 19th century. These Louisiana irises are some of my "babies" (irises I hybridized) that I did not want to keep for registration and/or introduction. They were great irises but not worthy of registration. I planted them in the edge of the "fresh water shrimp" pond and each year I see at least one that I think I should have kept and registered! Well, I had to put at least one of my "babies" in this blog. This is 'Our Friend Harry' and is named for a good friend and former president of the Society for Louisiana Irises, Harry Wolford of Palm Bay, FL. This is by the Koi pond and again you can see the large birds on the island and the arched bridge. This is one of Sue's (my wife) old species of Tall Bearded that grows well in Louisiana. Usually it is too hot and wet for Tall Bearded irises to do well in Louisiana (or in much of the subtropical south). This one is in a shaded area and grew quite tall, some 52 inches! If you are interested in learning more about Caddo Lake, please visit their web site at Caddo Lake. 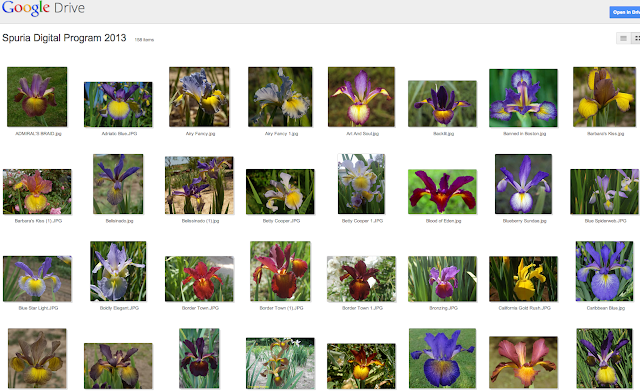 To learn more about all types of irises just browse over to The American Iris Society web site and check it out! We grow thousands of Louisiana irises here, many spuria hybrids, iris virginica, twenty or so hybrid tall bearded irises, some really old "hand me down" tall bearded irises, some species crosses and lots of Dutch irises. But we also grow many other beautiful plants. You can extend your gardening season with judicious choices of spring bulbs, flowering trees, and other perennials that bloom before and after the irises. Here at our gardens in Louisiana, springtime starts with the blooming of narcissus, snow flakes and grape hyacinths, continues with the daffodils and Dutch irises. Flowering Quince is another early spring bloomer and we have several plants in the front and side yards. One unusual tree that blooms early in this area is the redbud tree, which puts out its blooms before the leaves. Vivian, LA, just north of us, has the "Redbud Festival" each spring as these trees bloom. Another early bloomer, blooming in NW LA at the end of February, is an old species of tall bearded iris that are handed down through the generations. Every time I give a talk on growing irises, at least one person will comment "I grow the purple one" and this is the pass-along flower they mean. We also grow iris virginica in blue, white, and pink. 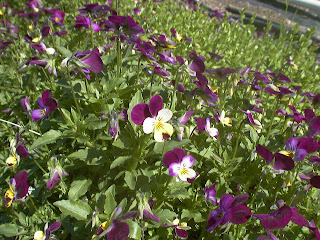 Another wonderful little plant that produces massive amounts of bloom each spring is "Johnny Jump Ups". 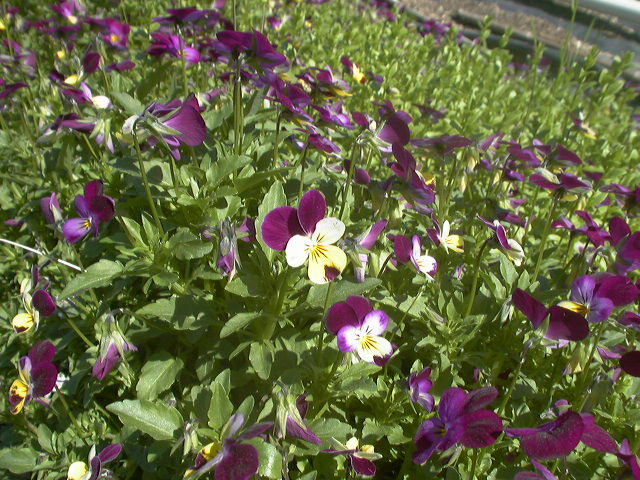 These little flowers are appropriately named because once you plant some, they "jump up" all over the place! 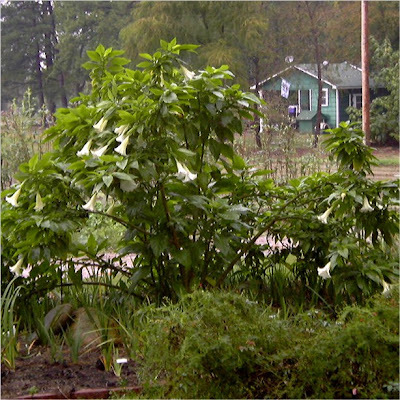 They are ideal with irises since they cover the ground with color without smothering rhizomes. 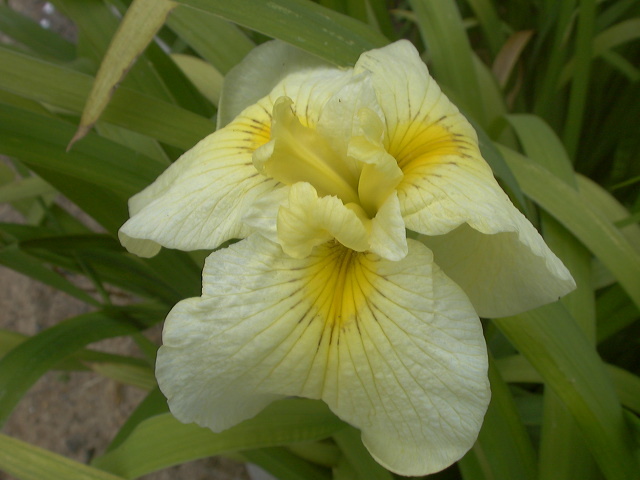 The Spuria irises usually bloom about the same time as the LA irises. An unusual iris we grow is 'Aichi-no-kagayaki' (Shinnosuki) a species cross that blooms late in the season, not until June. Close up of 'Aichi-no-kagayaki' which has Japanese iris in it. In June, the Amaryllis bloom. 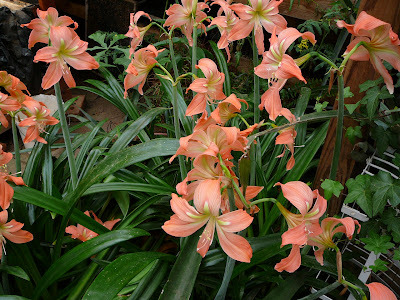 We grow many different hybrids of Amaryllis. My sister has been crossing them and producing new varieties. 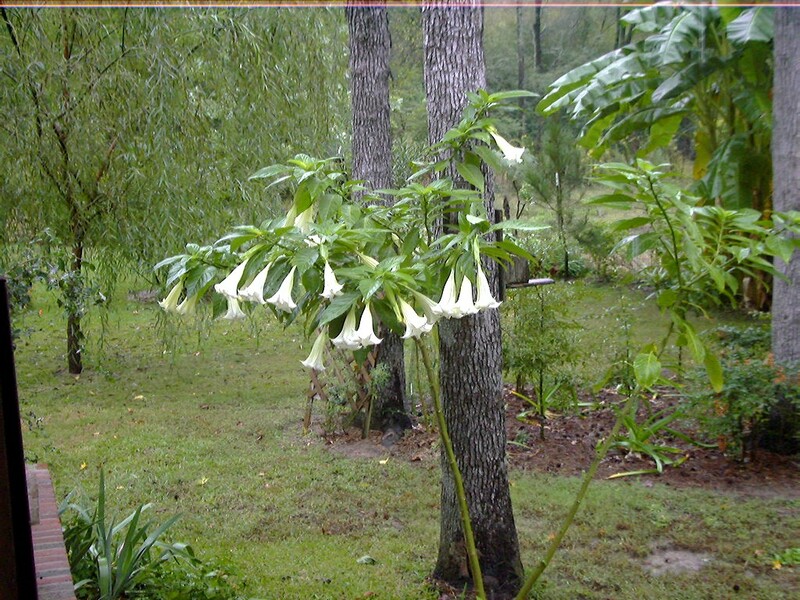 My wife Sue loves Angel Trumpets in white and yellow. These beautiful huge blooms are about the last bloom we see before the first freeze of the year. These are a few of the blooming plants we use to extend our bloom season here in Northwest Louisiana. What plants do you use along side of your irises to create a long bloom season? I bring you good news from the digital presentation world. Two new digital programs are available for Louisiana and Spuria iris lovers. 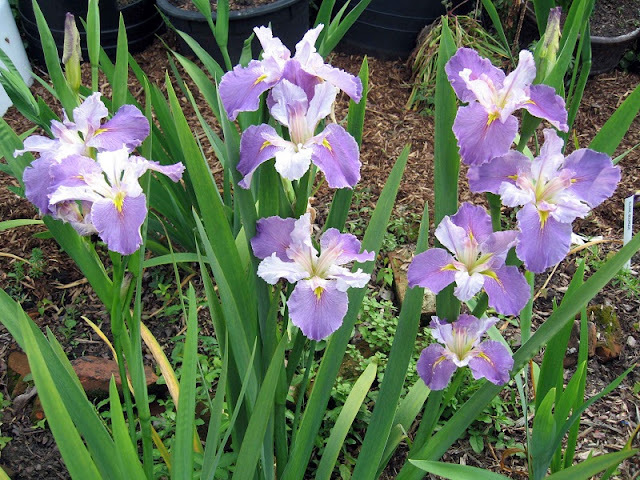 The Society for Louisiana Irises created a program called, "Growing Louisiana Irises," and the Spuria Iris Society put together the "2013 Spuria Digital Program." Wonderful images of Louisiana irises in the wild as well as in gardens are part of this exciting new program. The goal of the program is to show your audience the "how-to's" of being successful at planting, growing and preparing the soil to grow these beauties. 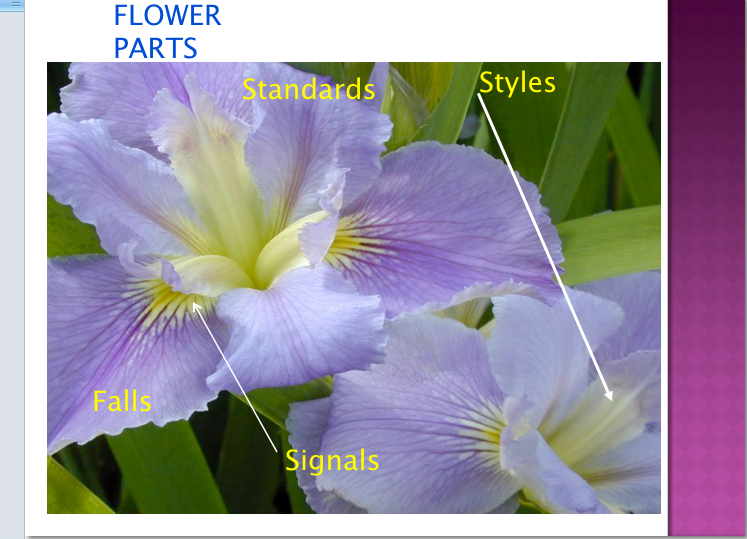 Also, the presentation has detailed information about soil requirements, flower parts (image below), and species and LA iris types are explained. 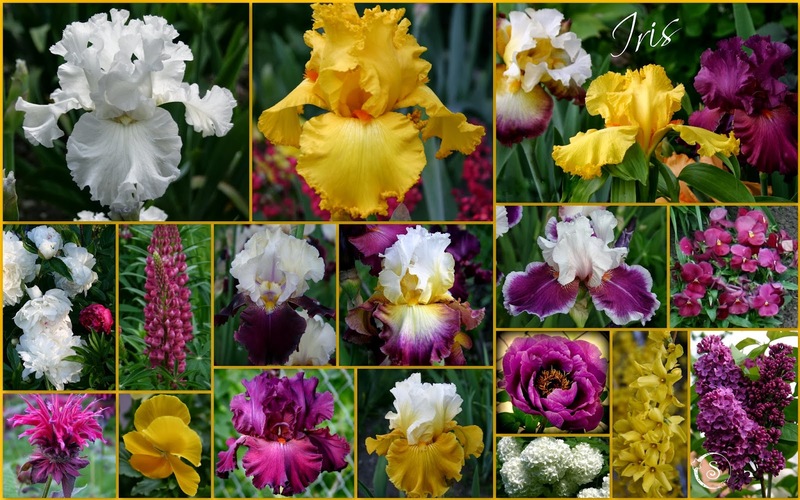 We can say with confidence that this presentation will leave you and those in your audience with plenty of reasons to include Louisiana irises in your garden. 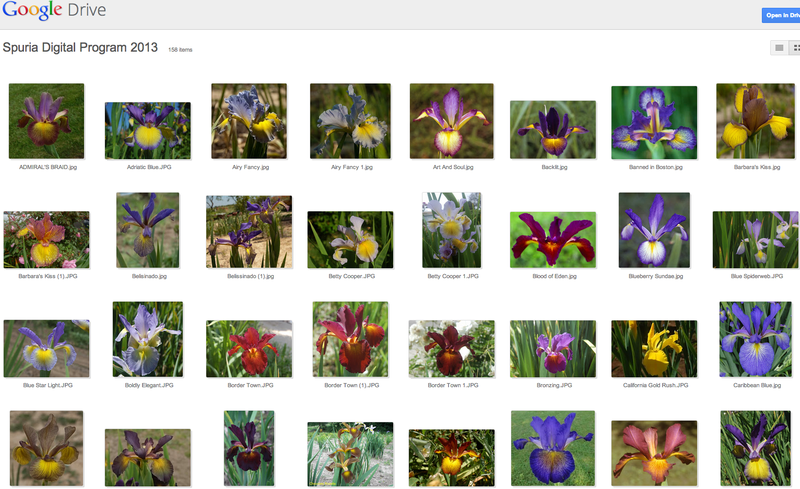 The Spuria Iris Society digital presentation is very unique in that it shows the huge variety of colors and forms available today. The presentation is mainly composed of a huge variety of predominantly single Spuria iris flower images that will open your eyes to the many possibilities that exist in this beardless beauty. From browns, to blues, yellows and now also very dark or pink Spurias, there will be some that you'll fall in love with. If you are able, please support these societies by becoming a member, or share this information with your family and friends who love irises. One of the most enjoyable aspects of growing TALL BEARDED IRISES is the countless ways we can use them in our gardens. Using a variety of COMPANION PLANTS for texture, shape, height and color can enhance the beauty of a garden. 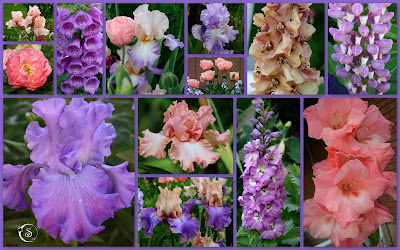 And, since the color range of irises rival nearly all plants--available in every imaginable hue, tone and color of the rainbow except maybe a true red--the possibilities are endless! 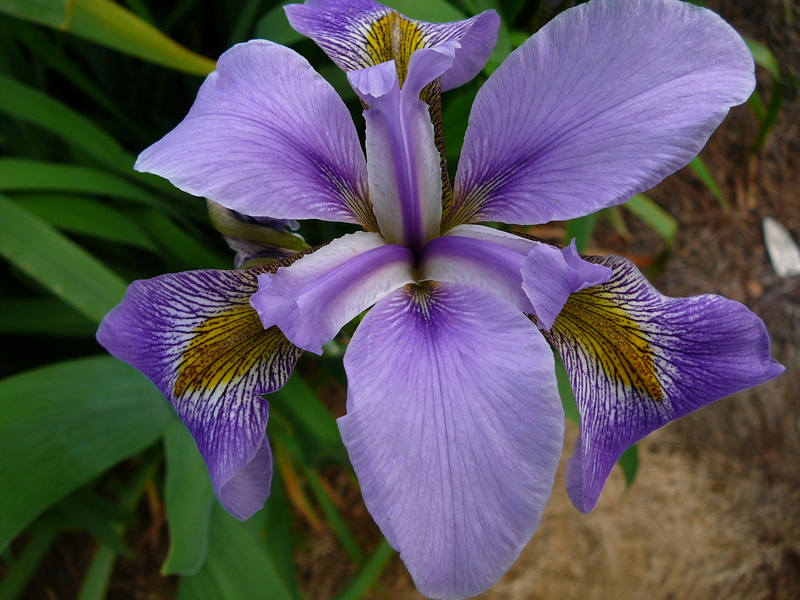 By using the early, mid and late blooms of the irises, there are several plants that fit into their window of bloom. For instance, the last of the single late tulips, or the first blooms of the hybrid tea roses overlap the early and late iris blooms. The colors, height and form of lupine add interest to the bed and are a favorite of mine to use because their bloom time perfectly coincides with the iris bloom time. Peonies, both tree and herbaceous, as well as poppies, are also favorites. Other perennials I have used successfully in the iris beds have been allium, clematis, columbine, dutch iris, foxglove, delphinium, lilacs, and even early gladiola, whose corms have over-wintered and start their growth early before I start planting new ones that will flower much later in the season. The good things about all of these perennials is that their growing conditions are compatible with the conditions needed for tall bearded irises. This pink bed uses the subtle and delicate tones of pinks and whites. 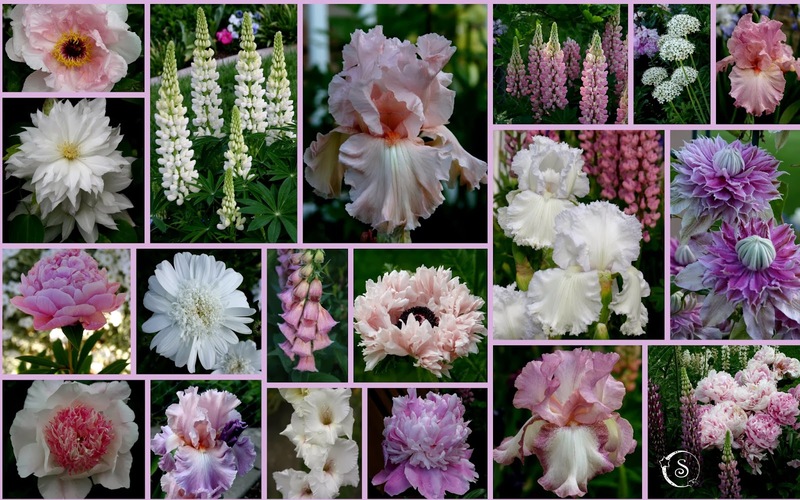 Clematis, poppies, peonies, gladiola, foxglove, and a variety of lupine in shades of pink and white go well with irises "EMBRACE ME," "ELISA RENEE," "LACED COTTON," "POND LILY," and "DATE BAIT"
The striking colors of "SKATING PARTY," "THROB," "LATIN LOVER," "STARSHIP ENTERPRISE," "RINGO," "VIZIER," and "SALZBURG ECHO," are complimented in this bed with peonies, lupine, pansies, monarda, and the last blooms of forsythia, lilac and snowball bushes. 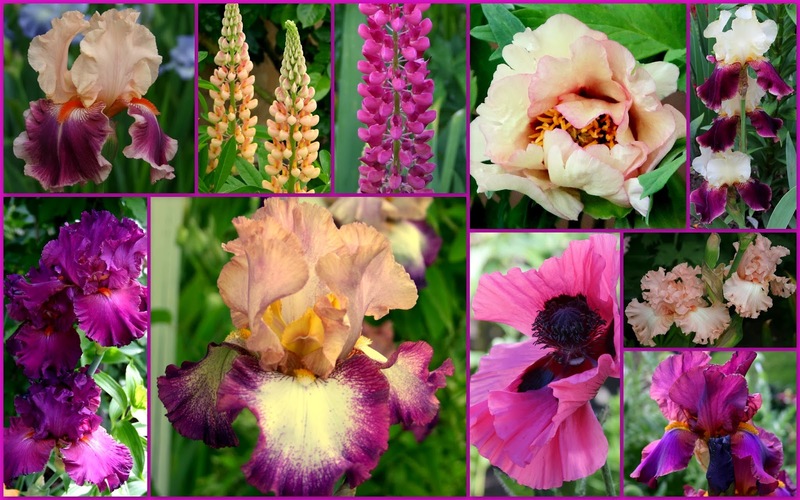 This bed of irises "PLANNED TREASURE," "MARY FRANCIS," "BUBBLING OVER," "COMING UP ROSES," and "POEM OF ECSTASY," with the complimentary colors of peach/pink and lavender/lilac contains poppies, itoh peony, delphinium, early gladiola, lupine and verbascum. When planning the beds, I look for companion plants that are relatively easy to grow, are hardy and reliable, and plants that look their best with minimal care. Keep in mind the growth of your irises and the room they need to establish a nice clump.These plants have worked well for me. But, as you plan your beds, don't be afraid to experiment. If it doesn't work, you can always move the plants around. What companion plants have you used in your iris beds? I'd love to hear what has worked well for you!